Rose Tremain, novels and the return of Northernreader! So, long time no see/post from the Northernreader! No excuses I’m afraid, just reading many, many books so far this year (49 !) which means that I have not been posting about them, just indulging in a little extreme reading…It’s living the dream in the Vicarage! 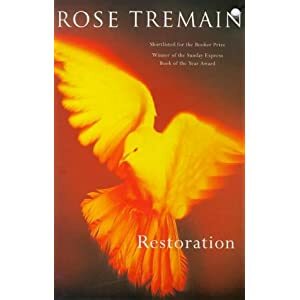 Two books on my list have featured highly within the last few months, both by Rose Tremain. The first, Merivel: A Man of his time, is the sequel to Restoration, which was a brilliant Bookworms book club choice of a couple of years ago. Despite it not being an historical period I know a lot about in detail, Restoration was popular mainly because of the main character, Merivel, and his adventures and misadventures in and around the court of Charles II. The other Tremain I’ve delved into is the prize winning The Road Home. I will admit that it was not one I picked up with terrific enthusiasm, as it was not one of her historical books, but it is the Bookworms book club choice (and one of the World Book Night books given away at the library quiz night, which modesty forbids me describing in detail…). It was a slow start, and I must admit thinking that it would be a bit of a haul. Lev is first seen on a bus from a vague East -European home, travelling in search of a new life in London. He hopes to find work, a place to stay, and earn enough money to send back to his small daughter and his aged mother . He has lost his wife, his job and even the entertaining friends Rudi and his wife are insufficient to keep him from his new start. London at first is an unfriendly, confusing place, but he is quickly (too quickly?) offered the chance of a home, a job which inspires him, and women offering friendship and more. I found his first few hours in the capital depressing but reasonably truthful, as a little money goes nowhere towards the securing of food and shelter. The subsequent finding of so much kindness of strangers does seem optimistic, especially when Lev can be illogical, infuriating and on one occasion, brutal. I hope that there are so many friendly people out there, so many opportunities, so much hope of a new start. There are some interesting characters in this novel, some realistic ones, but maybe the setting or incidents are not so truthful. Overall a good book, but perhaps not so real as it could be, even if I would have right royally complained if it had been depressing throughout! I have two book clubs to go to which are discussing this book, so I’ll see what they have to say. Leave a comment Rose Tremain, novels and the return of Northernreader! I may have mentioned before that I am so idle and underemployed – hmm – that I go to two Reading/Bookgroups. One of them has recently met to discuss Restoration by Rose Tremain. Over some wine and elderflower cordial, we discussed and debated this classic book, and I searched to my memory to recall bits about the film, which I last saw quite a few years ago – though I believe it is available with Czech subtitles on DVD if you have the technology to deal with it…. Anyway, for those of you who haven’t read this excellent book, it is a substantial novel, but not overlong, about the progress of Robert Merivel who comes to the notice of Charles the Second, recently restored to the throne. Robert’s father introduces him to the King, who adopts Robert as Physician to the Royal dogs, and unofficial Fool. The King chooses Robert as a token husband to one of his Mistresses, Celia, and presents him with a house in Norfolk, which Robert comes to love. Robert’s descent into Royal disapproval, his Exile to a Quaker Asylum, his ignominious return to a plague beset London, all sound ominous, but there are many touching, amusing and downright funny descriptions to balance the novel. This book brought out many issues. How does, for example, a woman author capture all the insecurities, emotions and details of a man’s life. Are there differences in how men and women write? If there are differences, have they diminished since Austen’s time, for example? Historically speaking, had the plague finished before the Great Fire, or did it end as a result? A contribution that Pepys was definitely in London made us think that several notables had indeed returned to London before the Fire, so we reasoned that the plague must have abated. We also admired Tremain’s description of Robert’s relationship with Pearce, his long term friend who almost seemed to act as a conscience. We debated the treatment of madness, contrasting it with other treatments available at the time, as well as what motivates a man who has many female contacts, to put it delicately. There does seem to be a lack of a strong female character, but it does mean that Robert’s character is examined in incredible detail.